The different ways a Teacher can communicate with parents on ClassTag. 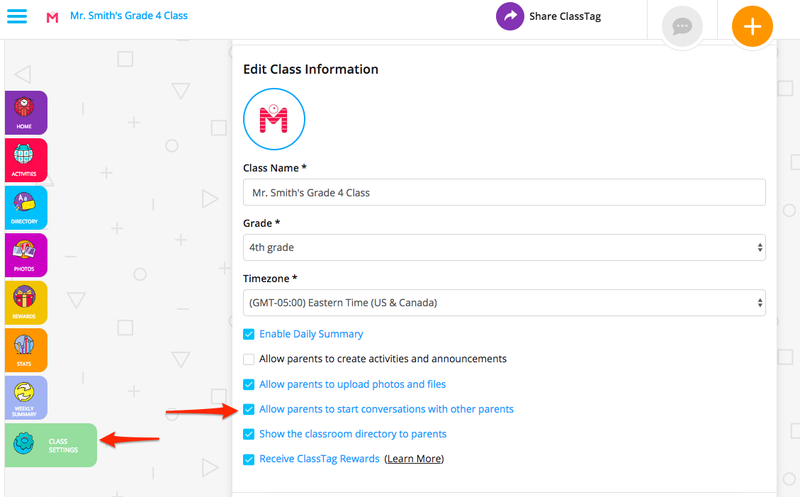 ClassTag is all about effective and easy communication with your class parents, whether you are looking to send a broadcast announcement or connect with parents individually and privately. The beauty of ClassTag is that parents start receiving all your communications as soon as they are invited. No parent is left behind even if it takes them time to join your class on ClassTag. All announcements can be made with just a few clicks! All you need to do is click on the '+' button - at the top righthand corner of the screen (using a computer) or click the square with pencil icon (using the mobile app). 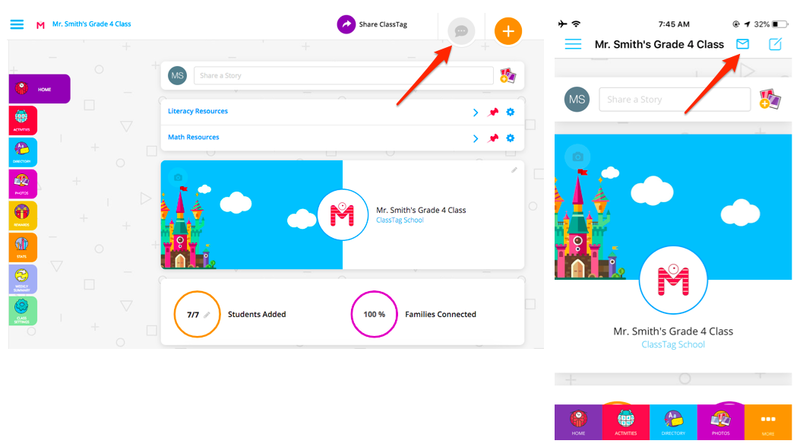 This button is accessible on any page of your class on the same position so that it is very easy to navigate and give you key parent engagement options right at your fingertips. Announcements are broadcast messages that you can send to all parents to share a great moment from the classroom, give them some tips and ideas on how to support their child or give a heads-up on something going on at the school. You can upload pictures, videos, and files along with the announcement itself. 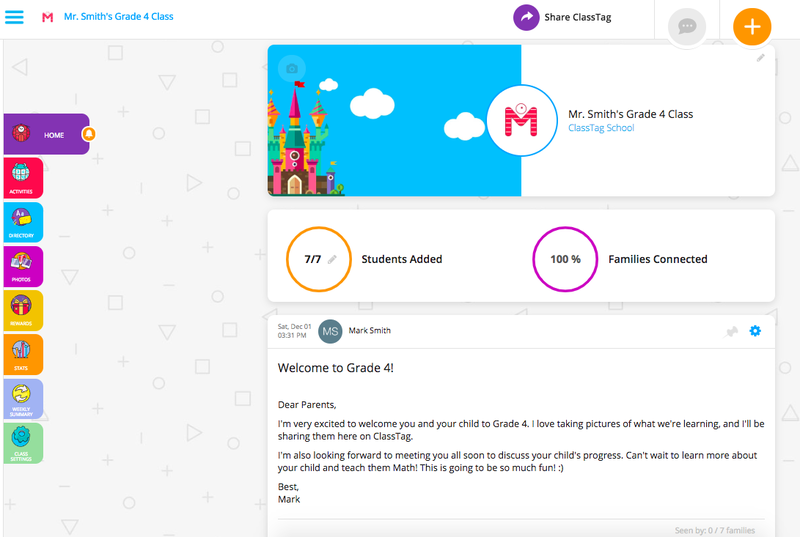 Announcements will appear on the Home screen for you and parents in your class. They will also arrive shortly as emails or SMS. Announcements delivered via email will use the Title as the subject of the email and Message as the body of the email, including up to 3 pictures and link to see more pictures and attachments. Email or SMS delivery of the messages would be determined by parents' communication preferences if they have both email and phone number information on ClassTag. Keep your communications organized by planning ahead and scheduling important announcements ahead of time. 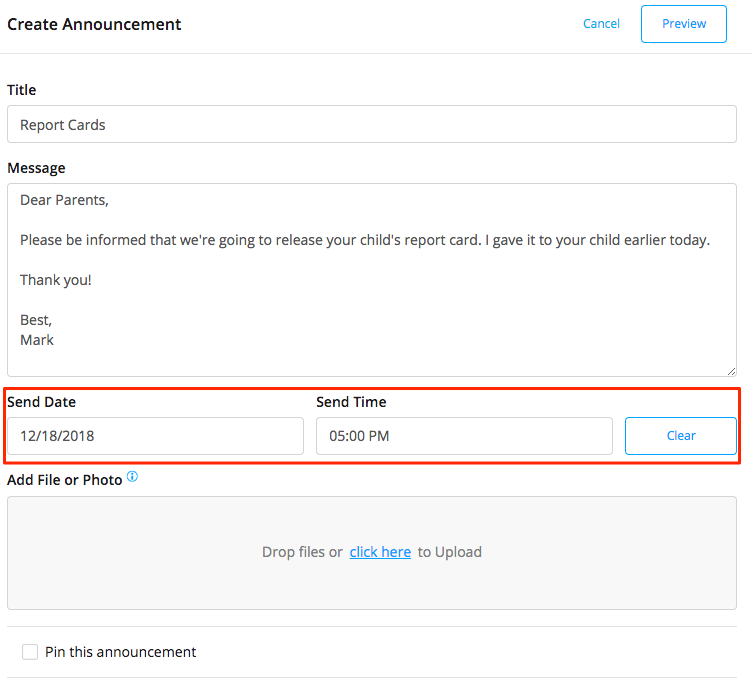 With this new addition to Announcements functionality, you can bulk schedule important messages for weeks ahead and be sure that parents will get them at the right time. Now, you can get it all done at once, without worrying about overwhelming parents with multiple announcements being sent at the same time. This can done by clicking on the pin icon on your Announcement. You can pin up to three announcements right when you create them or do so from the home page. This is a great way to attract attention to the most relevant information or resources you might be sharing. You can unpin the message once it is no longer important. When an announcement is unpinned, it will slide down to the rest of the feed. All announcements are sent to parents as emails or sms as soon as they are created, regardless whether you pin them or not! Want to edit or delete your announcement? You can do it at anytime. Change any details of your message by clicking the gear button and then choosing “Edit” or delete your announcement by choosing “Delete”. We do not resend edited announcements in order to not overwhelm parents with emails or SMS. If you have any significant updates to the message and need to send the information again, make it as a separate announcement. It is entirely up to you if you want to allow parents to make announcements in your class. You can experiment and go back to the Class Settings to change it. By default, parents cannot send announcements. Adjusting the settings is easy. Go to “Class Settings” and check the corresponding box (or uncheck it in case they get too enthusiastic, you know...😍 or spammy). You’re already familiar with Announcements which allow you to post instant updates visible to all parents. 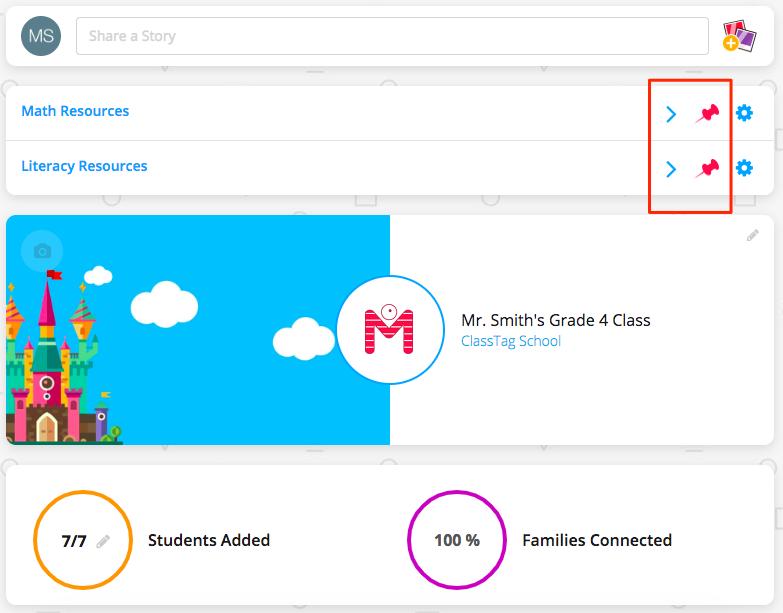 Now, you can choose between a Classroom Announcement (visible to all parents) or a Story (visible to all parents or parents of one student. Stories are a great way to send a picture/photo privately to a parent. You can create a Story right from your home page and add as many pictures or videos as you like (parents love pictures!!). It is the easiest way to share pictures and notify parents about them. You can also select a specific student from the drop-down menu and only his/her family will be able to see it. You don't have to even add a message, just load up the pictures, and share! If you are looking to share important information, announcements are the way to go. Rather than a notification about posting a Story, parents will receive the full message as an email or the title of the announcement as SMS with a link to see more. 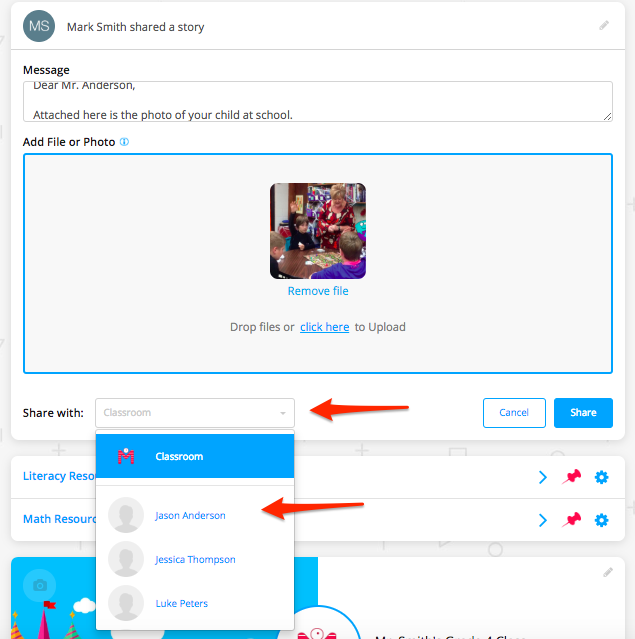 Teachers and parents can send private individual and group messages via ClassTag's conversations. 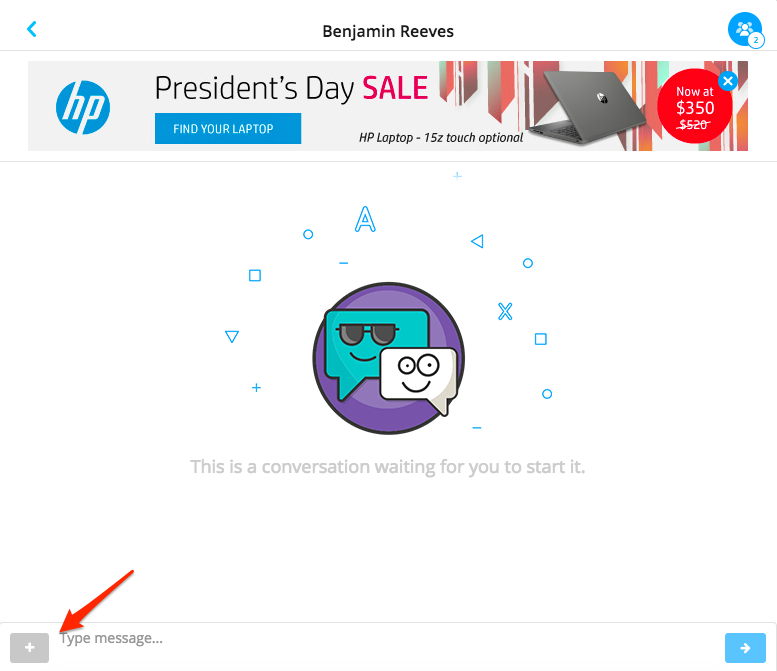 You can do this by clicking on the messaging icon (using a computer) or the envelope icon (using the mobile app) on the upper right side. If you need to send a file (e.g., photos, videos or documents), you can do this by clicking the gray plus key on the lower left side. It is best to use ClassTag's conversations when you are looking for a two-way communication with one parent, a family or multiple families. If you are looking to send information in a one-way fashion, sending an announcement is a good option. Messages are delivered to users as emails or SMS and in-app push notifications if users have downloaded the ClassTag app. 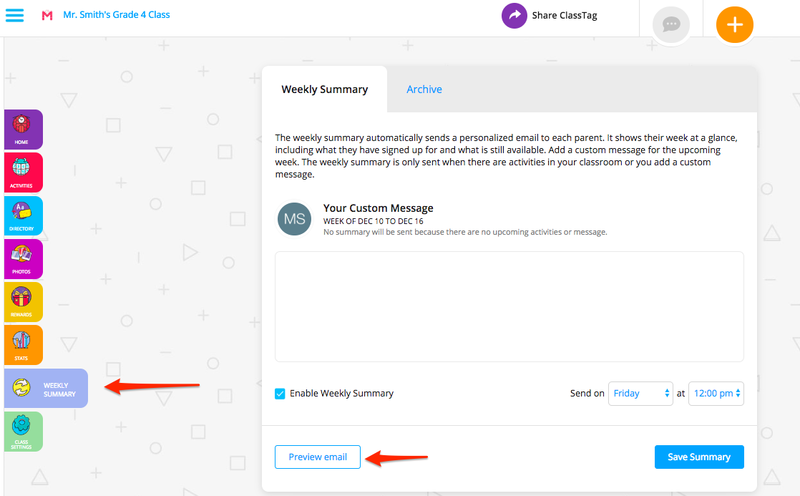 Replying to messages is very easy as all replies via email or directly on ClassTag will go directly to a single inbox on ClassTag. No more searching through long email threads mixed with other emails. 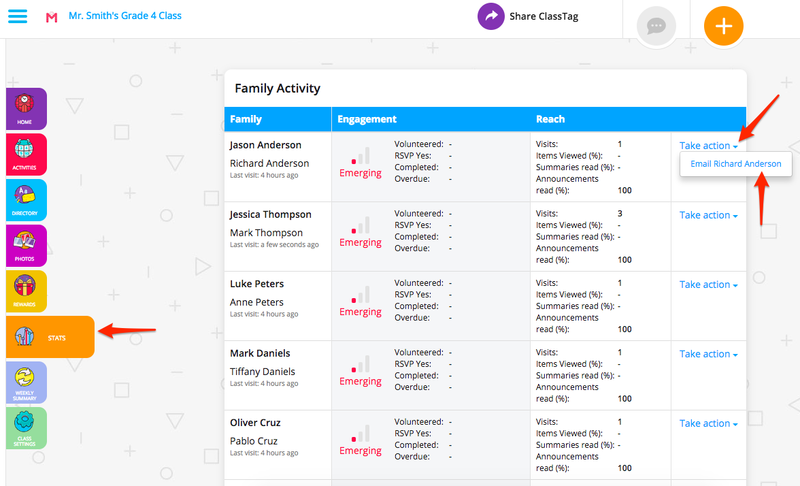 To ensure that parents don't get overwhelmed with responses, ClassTag will be grouping a number of messages together that come in within a few minutes before sending the information out to parents via email or SMS. Currently there is no direct reply via sms. When parents tries to reply to sms, they will be asked to send it via ClassTag conversations in the app or website. 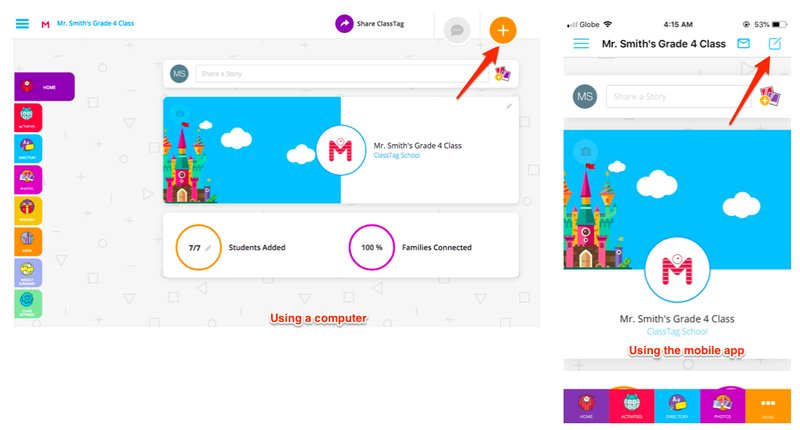 As a teacher, you can change your 'Class Settings' tab to allow parents to initiate conversations with other parents or not in a similar fashion to announcements. 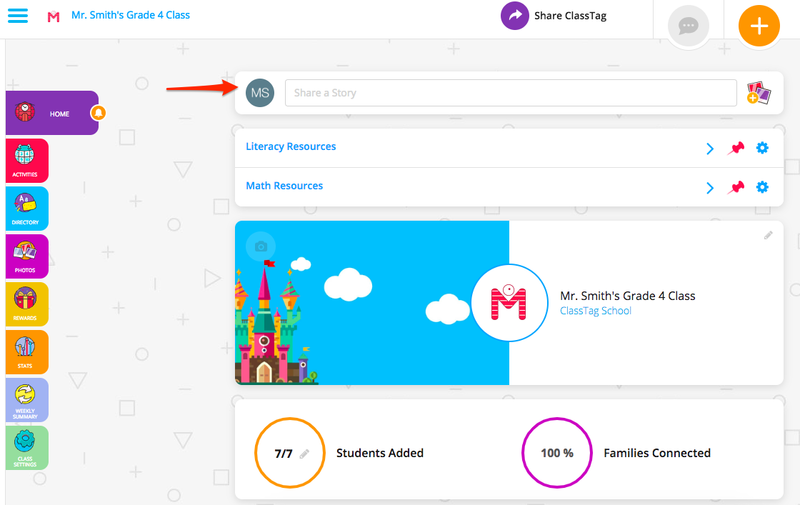 You may also find when looking at the Stats page that you want to reach out to a parent to encourage more engagement and participation in the classroom. You can easily do so from the same page by clicking on the Take Action drop-down menu on the right-hand column of the Stats page. You can access ClassTag from any iOS or Android device as an app (mobile and tablet). To download the app, please click the link given below. 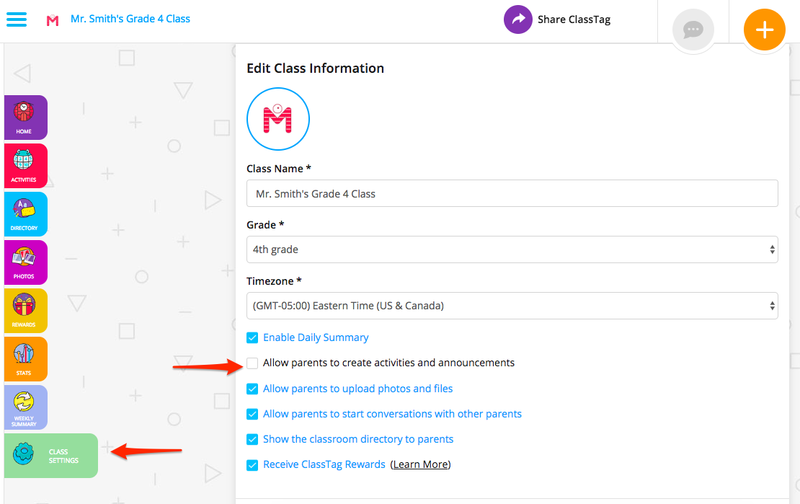 Teachers and parents love ClassTag because it saves time on all of the follow-ups and numerous reminders. Weekly Summary − teacher's favorite that substitutes the weekly newsletter and can be customized. The weekly summary is sent at 12 p.m. on Fridays by default (you can change this to your preferred day/time) when activities are happening next week or if the teachers have created a custom message creating a consistent system of weekly communications. Read below to learn more! 3. 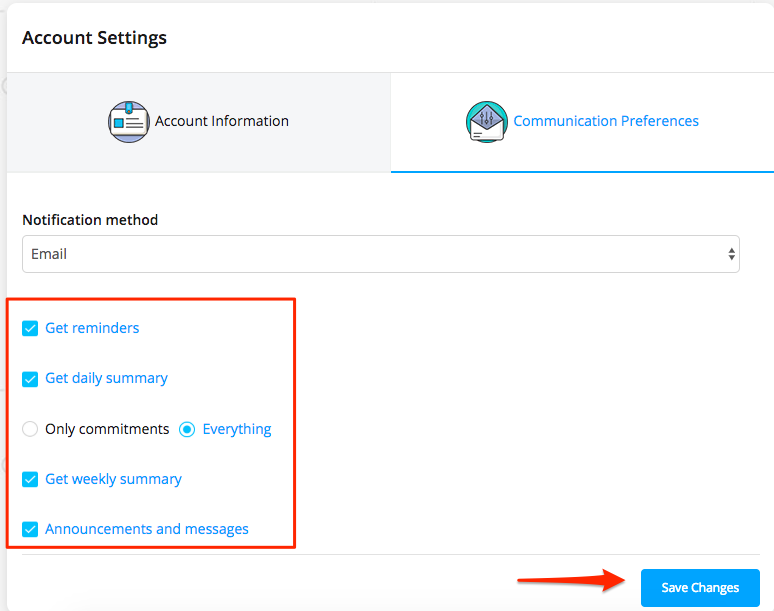 Click “Communications Preferences” and check the box and the corresponding updates and reminders you’d like to received, then click “Save Changes”. Wish your class parents a wonderful week and sum everything up! Our teachers' absolute favorite is the Weekly Summary on ClassTag. Optionally you can add a custom message to the weekly newsletter! It is a great way to highlight specific things you are learning, some funny moments or maybe even a question you would like parents to ask their children this week. When you're finished, don't forget to click “Save Summary” for the changes to take effect. If parents have participated in activities the week before, they will even be publicly thanked. What a great way to encourage participation! 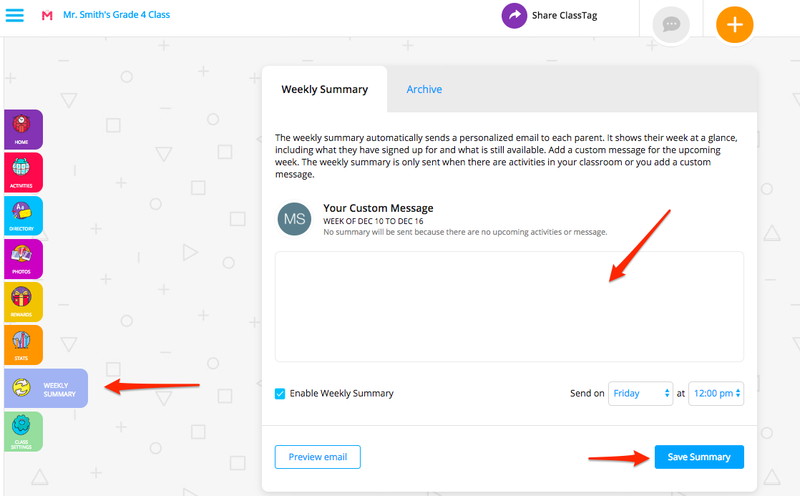 Find time on Wednesdays or Thursdays to ensure all activities are on ClassTag and keep adding ideas to custom message field throughout the week until it is time to send it!